Wedding Bells are Ringing! Congratulations Dad and Julie! I phoned up my dad the other day to ask him about the hotel reservations for his trip to Japan and he sprung a whopper on me! He and his girlfriend Julie are going to get married this August!!!!!!!!!!!!! I am so psyched! I think everyone in our family has been waiting for this and I know everyone else is just as psyched as I am! Congratulations Dad and Julie! You two are the best! Now how about getting these guys to perform at your wedding? Calling Dr. G, This is Your Station! 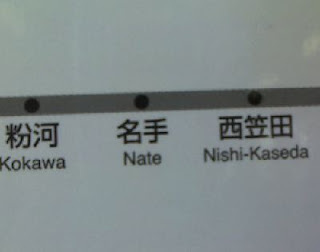 I was riding on the train this morning when I found this humourously named station on the JR map. I hope you guys like it too.